Nels Cline never seems to stop working. When the 58-year-old guitarist isn't on the road with Wilco, he's playing shows with musicians like Yoko Ono and Medeski, Martin and Wood or spending a few days in the studio recording tracks for one of his many projects. 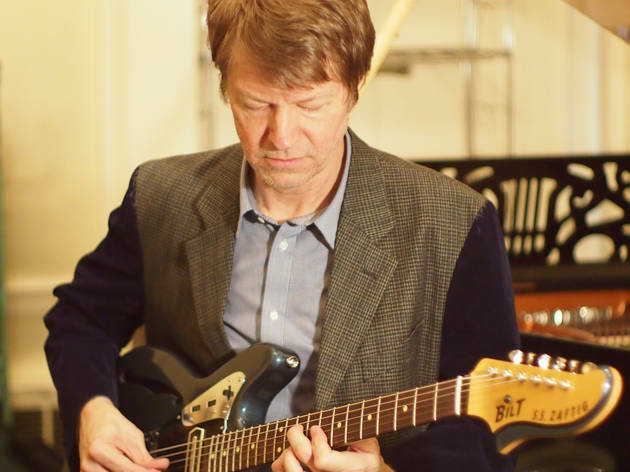 Last week he released Macroscope, an album that marks the return of his long-running trio the Nels Cline Singers. The record features plenty of mind-bending guitar solos while showcasing the group's varied musical tastes. We spoke with Cline about getting his band back together and the status of Wilco's next album. You have a fairly intimidating catalog. Are there a few records that you might recommend as a point of entry for people who only know you as Wilco's guitarist? A lot of people are into the record I did with Greg Bendian where we covered Interstellar Space by John Coltrane. If you want to hear a bunch of guitar free jazz shred stuff, that one is great. I did an album on Atavistic called Destroy All Nels Cline and it's one of the few records of mine that I actually listen to periodically. It was done at a time of considerable turmoil in my life, so it was a very cathartic project and I think that it says something satisfying about my dramatic sonic world. There's also a record of mine called Coward that is a work of pure obsession, using less-traveled ways of playing including microtonal work and acoustic songs. It's more personal and less rocking. 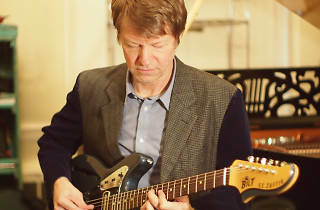 The new Nels Cline Singers record Macroscope was recorded with bassist Trevor Dunn instead of Devin Hoff. How did the personnel change affect the direction of the new album? I try not to be too much of a dictator with my records, but I guide the direction of a record with what I write, bearing in mind who's playing the music. It's hard for someone to fill Devin Hoff's shoes, but if anyone could do it, it's Trevor Dunn. So, in a way, it's just a continuation. My only regret so far is that my schedule has been so crazy while touring behind the last Wilco record that I haven't had enough opportunities to play live gigs with Trevor. I think that the impact of him in the band could become more pronounced as we start playing more shows together. How do you mix structure and improvisation when you're working on a record? It's something I've done since high school—I began wanting to improvise because it's enjoyable and might be what I'm best at. It's a good way for the people that I play with to emerge in the music without me having to have to tell them what to do. Certain pieces are written just to improvise on—they're just excuses for interplay or a template for a certain type of mood or groove. Some pieces are much more scripted, and those are the pieces that tend to be less about who's playing them and more about creating a certain compositional effect. I'm kind of vaudevillian in general because I'm always trying to have a balance of written and improvised, soft and loud, pretty and ugly. It's not particularly avant-garde, I just want to have a well-rounded presentation. The new record contains tracks like "Respira" and "Macroscopic" on which we hear your voice. What made you decide that it was time to come out from behind your guitar, so to speak? I sometimes scream into a Megamouth and sing into my pickups when I perform, so that's what made me start thinking that I could get away with some wordless singing. I was emboldened when I reflected on my love of listening to Baden Powell sing. He has a pretty out of tune voice, but I love the sound of him singing along with his guitar. Wordless singing exists on the record to create a more intimate experience sonically—I'm trying to draw you in by making the music sound more human and modern. My last two records are an attempt on my part to warm my own music up a bit—not as much Nordic angst as usual. Could you tell us a bit about the other projects you're working on currently? I finished a record with Julian Lage that's going to be out in the fall on Mack Avenue Records. I also finished a double album of jazz-ballads that are orchestrated, arranged and conducted by Michael Leonhart, a trumpet player and arranger. That's a mammoth project that I've been dreaming and obsessing about for over 20 years called Lovers and, with any luck, that will be out early next year. I wrote a piece for the Kronos Quartet that was premiered at UCLA a month ago and I'm recording with Mike Watt and Greg Saunier of Deerhoof this summer. The next Wilco album is on a slow road so it may take a while for that to emerge, but we're going to play some shows this fall. The Nels Cline Singers play SPACE on May 6 at 7:30pm.